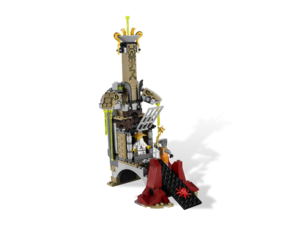 9450 Epic Dragon Battle is a Ninjago set released in May 2012. 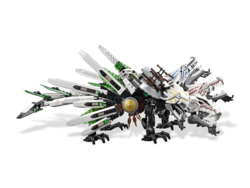 It contains 915 pieces, and seven minifigures: Lord Garmadon, Lloyd Garmadon, Jay ZX, Sensei Wu, Acidicus, Skalidor, and Chokun. 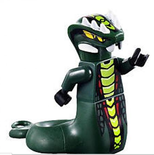 It is intended for ages 8–14, and features models of The Great Devourer, Ultra Dragon, and a Serpentine prison building. Epic Dragon Battle is essentially made up of three parts; the Serpentine prison, The Great Devourer, and the four-headed ultra-dragon. It also includes a total of seven minifigures: Lord Garmadon, Sensei Wu, Jay ZX, Chokun, Generals Skalidor and Acidicus, and introduced Lloyd Garmadon in his green ninja garb. In addition, it also includes a red spider, twelve weapons, including the Hypnobrai Fang Blade, all of The Four Golden Weapons, and an orange brick separator. The prison is raised off of the ground by two light grey arches and can be accessed by a black ramp which leads right up to the cell door. Two tall, dark red rocks are on either side of the ramp's point of depression. The cell door itself is barred and light grey and may be lifted to remove or place a prisoner, normally depicted as being Sensei Wu. A sticker on the inside shows that Wu has been imprisoned for thirteen days. The walls to the side of the cell are made up of tan bricks depicting masonry and older grey pieces. On the roof of the cell are dark brown arches which support a tan pillar with stone snake heads dripping a green substance to each side. At the base of the pillar are two metallic scimitar swords for decoration. A sticker on the pillar adds a design suggesting the liquid in dripping from the snake heads flowing down from the top into them. The structure is topped with a grey dish that has a plume of the green substance and two decorative, golden snakes to the side. The top of The Great Devourer's head is coloured mostly lime green with the exception of two of his three plumes, which are dark green. Its eyes are slit-like and red. It has four silver fangs in his mouth, two larger ones protruding from the top and another two smaller ones from the bottom. Its lower jaw is coloured dark grey and is a reused rock piece. In contrast to its head, the rest of the devourer's body is dark green with lime highlights, though changes back to the pattern of the head at the end of his tail. Each of his body sections are movable allowing him to be posed, as well as his plumage. 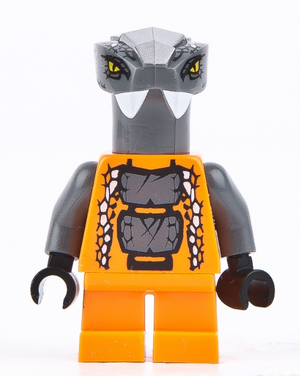 Its mouth may also be opened to fit a regular minifigure. The main part of the set, the Ultra-Dragon has four black, clawed feet and matching legs in the front which can be bent at the foot, knee and where it meets the body. The back legs are broader and are white, with golden rice hats acting as scales (the same mould as Sensei Wu's). The dragon's wings, one on each side of his body, have white feathers of varying sizes decorated with black, transparent brown, and transparent green pieces. The feathers sprout from a stumpy, brown arm decorated with another golden rice hat and a hand on each side of the dragon with three brown fingers golden talons hangs from them. The tail which sprouts from the back of the body has transparent green scales which slant slightly upward and are decorated with more black pieces. A few white scales in a similar fashion, but without the black decorations, are on the sides. The tail ends with a long black piece. The dragon's body itself is mostly white and sleek, except for at the top of the back where it turns grey and a brown seat is perched. Each of it's four-heads resemble one of the previous year's four elemental dragons, but with white heads and grey beards. The heads decorated with blue and yellow, the one farthest to the left and the one farthest to the right, respectively, have launchers in their mouths to shoot a green "zamor" sphere, though only one is included between the two. Lord Garmadon has a black helmet samurai helmet with white bone in it. His head is black and demonic with red eyes, an opened mouth with white teeth, and various dark metallic lines on his head. Rather than having a single torso as most minifigures do, Garmadon has two. His first one is slightly smaller than usual and has dark grey armour moulded onto it which is fit to go over much of the lower torso also. This torso has black arms and fits onto what is usually the head connector for most torsos. Though most of the bottom torso is covered, it depicts a visible rib cage with a belt sash above his hips. He has two more arms on this torso The black legs have the purple belt extending from the torso into a knot and split into two sashes. He is accessorized with all of The Four Golden Weapons, the Sword of Fire, which resembles a katana, but with the blade erupting from a dragon's head, a Shuriken of Ice which has three points, the Nunchucks of Lightning, which is built out of two golden handels and a short golden chain to connect them, and the Scythe of Quakes which is built out of a golden rod, another golden handle, and a golden tooth also used for the dragon's fingers. Garmadon's brother, Sensei Wu, wears a white kimono and a golden rice hat. He has a long, white beard and mustache which hides his elderly face. He is armed with his brown staff of the dragons. Jay ZX wears blue ninja garb. His cowl has silver decor and he has matching shoulder pads. His torso, while mostly blue, is turns grey on the left side of a dark blue line which slants upward from the lower left. His left arm is grey to match. He is armed with a single sai. Chokun's grey head sprouts from a tall, thick neck and has no visible lower jaw. He has an overbite with two large, white fangs. His torso is orange and has two large, grey scales printed centrally on it with various smaller and lighter ones to the sides. His arms are grey, hands black, and his legs are short and orange. He is armed with a golden morning star. Skalidor has a winding snake tail instead of normal minifigure legs. He is coloured in black and has large orange scales, similar to Chokun's, going up the front of his body with various dark grey slits and smaller, light scales to the sides. His head hunches over his body and he has two fangs, also similar to Chokun. His head is black with a few dark grey scales and fewer orange ones on his fore head. On the top of his head are grey spikes which extend down his neck and spread to the sides. His eyes are coloured yellow. Skalidor is armed with a double-bladed axe made from a brown spear turned upside down and two black blades on the other end. Acidicus is similar in design to Skalidor, both being Serpentine generals. 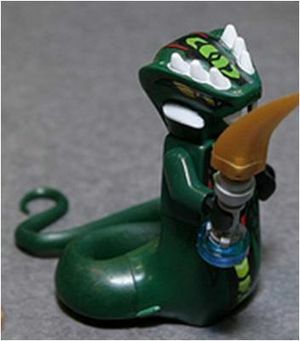 He is coloured dark green and has the same snake tail piece, but with slightly smaller lime skales going upward with small, black and triangular, dark red ones to the sides. His head once again has no visible lower jaw and two fangs. Unlike the others though, his forehead is sleek and resembles a snake hood, covering his four yellow eyes. His forehead is decorated with more lime scales and three white spikes on either side. He has one more sideways fang on either side of his head, under his eyes. He holds the Hypnobrai Fang Blade made from a silver tooth, a silver handle, and a round, transparent blue, studless piece printed with the Hypnobrai symbol. The green ninja, Lloyd Garmadon, has a similar cowl to Jay, but in green, and the same should pads, just in a darker shade of silver. His torso is green with a ninja robe which splits down the center, showing part of his chest and a white undershirt. On either side are silver sequins and a dark green belt, matching his arms, is printed above the hips with a silver buckle. His legs have more sequins and a continuation of the belt, featuring the knot and the ties. Lloyd is armed with a golden katana. During the Rise of the Snakes story-arc, Pythor was trying to release The Great Devourer by collecting the four Fang Blades, one of which is included. Pythor completed his goal, despite the intervention of the ninja, Sensei Wu, and Lloyd, though Pythor and Wu become the first things devoured before it chased after the four ninja. The monster consumes the Destiny's Bounty and destroys the Ultra Sonic Raider. It slithered to Ninjago City, where it continued to consume. The Ultra-Dragon saved the ninja after they tried to stall the reptile for more time. The dragon and the snake fought, but the snake won once again. Eventually, Lord Garmadon came back and the ninja give him the golden weapons. Garmadon then reached what seems to be his full potential, and destroyed the Great Devourer. He then disappeared with the Golden Weapons. The set, however, depicts a different story. After the snakes had summoned The Great Devourer and captured Sensei Wu, Lloyd Garmadon and Jay arrive. While Jay fought the Serpentine to attempt to free his master, Lloyd battled The Great Devourer with his Ultra-Dragon as Lord Garmadon arrives and tries to defeat the great serpent. The box-art shows Lloyd Garmadon in his ZX suit flying his Four-headed Ultra Dragon. Jay battling The Great Devourer, the head of the Lightning-dragon shooting a green ball at Lord Garmadon who is holding all four golden weapons, Sensei Wu in a cage with a snake-like building using two printed sloped pieces of a snake head like the one used in Venomari Shrine, and three Serpentine - Acidicus, Chokun, and Skalidor. Lord Garmadon is holding all of the four golden weapons. This recreates the end of the final episode from (Season 2), when he harnesses the power of the golden weapons to destroy the Great Devourer. This is the third set to include all four golden weapons, first being the 2507 Fire Temple and second being the 9449 Ultra Sonic Raider. Skalidor and Acidicus are exclusive to this set. 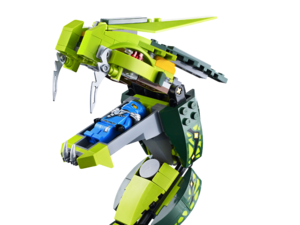 Lloyd's variation also appears in 9574 Lloyd ZX, Sensei Wu and Garmadon's versions appear in 9446 Destiny's Bounty, and Chokun in 9591 Weapon Pack. In the LEGO Ninjago: Character Encyclopedia, it says that only Lloyd Garmadon can control the Ultra Dragon. But in Episode 26 Rise of the Spinjitzu Master, Sensei Wu is seen controlling it. What the encyclopedia probably means is that Lloyd Garmadon is the Ultra Dragon's rider. This set is one of the largest Ninjago sets and has several rare or exclusive characters. Both Skalidor and Acidicus are exclusive to this set. Lloyd ZX, Chokun and Lord Garmadon (2012) can only be found in one other set. Lloyd ZX in his spinner set called Lloyd ZX. Chokun in Weapon Pack. Lord Garmadon (2012) in Destiny's Bounty. All of the dragons heads(with the exception of the earth dragon)Have their respective elemental symbol printed on their fore-head. This set was later reimagined as 70679 The Ultra Dragon. This is a description taken from LEGO.com. Please do not modify it. (visit this item's product page) Defeat the Great Devourer in the epic battle between good versus evil! The epic battle of good versus evil has begun! The Great Devourer has been awakened and threatens to devour the world of Ninjago. Can the legendary green ninja, riding the awesome 4-headed Ultra Dragon, overpower this evil adversary? Can Lord Garmadon harness the power of the 4 golden weapons of Spinjitzu to destroy the mighty snake and what about Sensei Wu? Can Jay defeat the evil snake Generals Acidicus, Skalidor and snake soldier Chokun to release his master from the impenetrable snake prison? Only you can decide the outcome of the final battle between good and evil! Includes 7 minifigures: Lloyd ZX, Jay ZX, Sensei Wu, Lord Garmadon, Acidicus, Skalidor and Chokun. Set features 4-headed Ultra Dragon, The Great Devourer, snake prison, Hypnobrai fang blade with blue anti-venom capsule, 4 golden weapons and 7 regular weapons. Snake prison features opening gate and space for minifigure with snake venom trap! Release Sensei Wu from the prison! Facts about "9450 Epic Dragon Battle"
Defeat the Great Devourer in the epic battle between good versus evil!